I was a bit surprised that Carl Kylander has been named as the new senior warden, not because of any lack of faith in Carl, but because he is often out of town on business. (Apparently, that is why, when he was junior warden last year, we also had an assistant junior warden.) Perhaps this really isn’t a problem, however. Whereas the junior warden often needs to be on-site to deal with building issues, the senior warden functions more in a consulting role, something that can be done by telephone, e-mail, or other electronic communications. I had just finished reading the aforementioned e-mail message when another missive from St. Paul’s showed up in my inbox. This message, once again, was dealing with foul weather problems. I thought this message was actually rather clever—St. Paul’s will simply follow whatever policy is implemented by the Mt. Lebanon School District. But, it would have been helpful to have mentioned in the message where to find the decision made by Mt. Lebanon Schools. Not all Mt. Lebanon residents and few non-residents are used to checking whether the Mt. Lebanon schools are open, closed, or opening late. I went to St. Paul’s annual meeting with a written list of questions. I didn’t get much past asking question 1. (See “Annual Meeting Report.”) I got something of an answer to my second question, but I don’t consider anything that I was told to be definitive. I do expect to pursue answers to these questions, and I will post the answers here as I ferret them out. I am confused about how loans are represented in the financial statement. In the Operating Fund balance sheet on page 14, there are lines for both short-term and long-term loan liabilities. Can you explain this? Follow-on question: In the cash flow statement on page 19, there is an item called PNC and Diocesan Roof Loan Payments. On the previous page, at the end of the Operating Fund accounting, there is an item labeled Less Debt Principal. Does this not represent the payments of both principal and interest on our two loans, since the amount is the same as the line on page 19? Page 21 shows $3,000 “donated” to the Refuge Service Fund from the Education Fund. What is the Education Fund intended for, and how does a “donation” to Refuge constitute support for “education”? On page 20, there is a $25,000 item in Contingency Fund expenses labeled Write of 2010 loan to Operating Fund. Is it not true that this is not a loan intended to be repaid but simply a withdrawal from the Contingency Fund? Moreover, if this is revenue into the Operating Fund, why does it not show up under Revenues on page 15, rather than as capital (i.e., equity) on the Operating Fund balance sheet, where it is labeled Write off Loan from Contingency and Revenue Funds? (On the other hand, interest income from the Contingency Fund, which was transferred to the Operating Fund, does show up as revenue on page 15.) Is it not true that the Operating Fund less loan payments actually has a surplus of $13,472.96? Moreover, is it not true that if all the opening balances of the special funds are added together and all the ending balances subtracted, there is a net loss of less than $600? Follow-on question: Whether legitimately or not, are we not removing more and more items from the Operating Fund—at a serious risk of obscuring our true finances—in order to reduce our assessment liability to the diocese? Do you intend to not report donations to the Salary Restoration Fund to the diocese as operating revenue? What is the difference between the Property Commission, whose expenditures are shown on page 16, and the Property Fund, accounted for separately on page 22? Did the $25,100 in donations come from parishioners and, if so, why is this outside the Operating Fund? Why does the Episcopal Church Men Fund, which contains $2,542.19 show no interest income? Under Refuge expenses on page 26, there is a $5,264.86 item labeled Musicians. Exactly what musicians are being paid? Does this include Bryan Sable’s salary? If so, does it include taxes and other benefit payments paid on his behalf? Is part of his pay buried under Total Personnel Commission? In the accounting of the Friends of Music account, to whom was $800 paid for Music Guild Admin? Who was paid the $1,000 Salary listed two lines down? In his report on Refuge, Kris Opat stated that the parish contributed $8,000 in seed money to Refuge. Why is there not $8,000 in income from the parish shown in the Refuge Service Fund on page 26? The 2011 budget looks very similar to the 2010 budget. I noticed, however, that worship and music has been reduced from $17,000 to $13,900, although actual 2010 expenditures were only $15,511.38, since we did not provide the budgeted $1,000 to Old St. Luke’s. Do we anticipate any support for Old St. Luke’s, and where do we expect to save $2,100 on music? What is the budget for Refuge for 2011? Do you anticipate receiving funds from the diocese? Kris Opat indicated that there is enough money set aside for Refuge to support the service through Pentecost. Do you intend to run the service during the summer, and, assuming you are expecting to offer Refuge in the fall, where do you expect to get the funds to do so? Of the $610,000 listed as 2011 pledge income, how much is currently pledged and how many pledge units does this represent? In his report on Refuge, Kris Opat stated that an average of 34 people attended Refuge services, though this apparently counts the people putting it on and is inflated by the attendance at the first service and a service that members of the confirmation class were required to attend. What has been the average attendance at the other services that St. Paul’s conducts? In particular, how many people, on average, attend the 8:45 versus the 10:30 service? A question for the senior warden: Your report was quite glowing, and it left me thinking that St. Paul’s cannot be better than it is now. Is there any area in which you see need for improvement? If so, where do we need to improve? Today’s annual meeting at St. Paul’s was a whitewash. It began in a rather poetic manner. I had pointed out to Doug Starr before the meeting began that the handout containing the opening hymn, “Christ is made the sure foundation,” was missing the last line of music and words. We sang it anyway. Everyone in the choir knew the tune, and most seemed to know at least some of the words of the last line. A few people had hymnals; others simply looked perplexed. Because there was no contest for the four Vestry positions, voting seemed pointless. I submitted a blank ballot. Doug had asked the choir to leave the meeting at 10:20 to practice for the 10:45. I had decided to leave early only if there was no reason to stay. There wasn’t. Lou talked about the annual report and said that if anyone had any questions about the financial statements or anything else, they could talk to the relevant people one-on-one outside the meeting. Remarkably, the treasurer, Bob Johnston could not attend. Most of my questions—I will list them in my next post—were of a financial nature, and some were quite technical. Nonetheless, I raised a point of order and asked if we could ask questions. I was told to ask, but it was clear this was not going to go well. Lou tried to answer my first question and either did not understand it or simply could not provide an answer. I tried to ask a follow-up question, but it was clear that the crowd had no interest in this sort of thing. I shut up and left soon after to attend choir rehearsal, though not before saying that I didn’t understand what the annual meeting was for. The point in asking questions, in my mind, was not only to get answers, but also to let others hear both the questions and answers. Talking privately to the treasurer does not accomplish that. I did ask for a public session in which people could ask questions of the treasurer, which Lou seemed to agree to set up. We’ll see if such a meeting materializes. I did stay long enough to hear Lou talk about the parish’s great successes in the past year, though he expressed disappointment in failing to launch a capital campaign. Surely we have not heard the last of the capital campaign idea. I understand that the Pickerings have the misfortune to be in Egypt now. This is obviously bad timing. Pray for their safe return. This is my last report before tomorrow’s annual meeting, not because I have run out of observations, but because I have run out of time. Although it might be helpful to summarize what I have said already, I will instead try to cover new ground and point out what I see as big, rather than trivial, problems. First, let me say something about the form of our financial reporting to the parish. We take 16 pages to explain our financial position and use no notes to explain that which is not obvious. (In particular, we do not cross-reference related figures.) It is difficult not to believe that the purpose here is to obscure, rather than to elucidate. Moreover, more than 60% of our expenditures are unexplained (i.e., in “Total Personnel Commission”). It is also difficult not to believe that we have so many activities “off-budget,” i.e., not in the operating fund, in order to avoid their incomes being counted in the calculation of our diocesan assessment. (I have not seen how St. Paul’s’ assessment is calculated, so I may be completely wrong here.) I am concerned that the Salary Restoration Fund will effectively shield part of salaries from affecting our diocesan assessment, though I doubt that it was created for the purpose. Christ Church, Indiana, recently had its annual meeting, and I happened to get hold of its annual report. The proposed 2011 budget is listed in great detail on pages 16 and 17. Salaries and fringe benefits are clearly shown. Pages 19 and 20 provide a detailed balance sheet, including account numbers analogous to those used by our own parish. Special funds are listed in the same balance sheet along with “operating” funds under the heading of “Equity Funds.” (Such funds include that for ECW, for example.) Pages 21 and 22 show a detailed profit & loss statement. These six pages of financial information inspire great confidence in both the financial health and financial transparency of Christ Church. 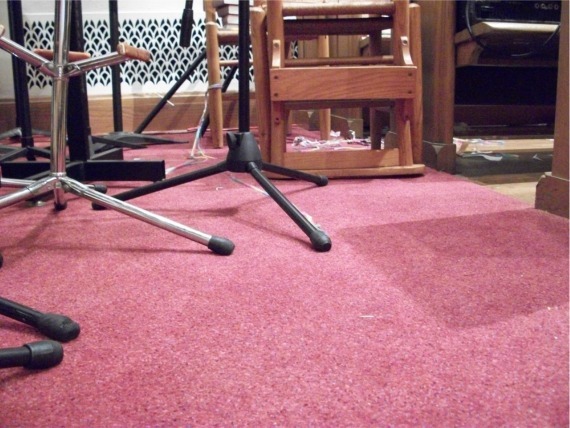 (Parishioners are informed that there is $0.24 in the carpet fund, for example.) Christ Church had a net income of more than $2,000 last year, which is a much better result than we achieved. Finally, I should say a few things about the so-called budget for 2011 that will be presented in tomorrow’s meeting. The budget contains 34 lines. The 2010 accounting of the St. Paul’s operating fund alone contains 100 lines. How can this possibly give an adequate view of intended 2011 revenues and expenditures? More to the point, only the operating fund is represented in the budget presentation. What will Refuge cost? How much money do we expect to spend on building repairs and improvements? What will ECW take in and spend? Who knows? It is interesting to compare this chart with the budget numbers, which show no money for outreach—our diocesan assessment is not outreach, and serving on diocesan boards is not outreach—and no money devoted to children and youth, among other things. The pie chart, I fear, is the product of smoke and mirrors. I’d like to return to Refuge in this post, as I have not yet taken notice of Kris Opat’s report on the service that appears on page 4 of the annual report. First, let me admit that Refuge has its virtues, but such a service would make more sense at an urban cathedral than it does in the affluent but quiet suburbs. Moreover, a project like Refuge should only be undertaken by a healthy parish looking for new challenges, not a parish like our own with many discontents and a widespread belief that the last “new” service has been a failure. Having said that, let me offer three stories. I have all of them on good authority, but I admittedly heard them secondhand. First, the good news (sort of). A member of the Unitarian church down the street came to a Refuge service and was quite impressed—impressed enough for her to invite a friend to the service. (I know the friend.) She remains a member of the Unitarian church, however. I was told of another woman who liked the service and showed up at Dickens’ Dames, certainly a good sign. My final story is less happy. From the beginning—see “Reflecting on Refuge”—I have complained about the absence of adequate lighting in the Refuge service. I understand the desire to create a relaxing, contemplative atmosphere, but humans are neither owls nor bats; we become dysfunctional in real darkness. Apparently, a worshiper tripped at a recent service. This should be a wake-up call, but I don’t have confidence that it will be. Now, to the matter of Kris’s report. He notes that an average of 34 people attended the service in 2010. Attendance over the 15 weeks Refuge was put on in 2010 is shown in the graph below. If the two special Sunday services are excluded from the data, the average attendance was about 30. (The number would be slightly higher if we were to throw out the data for Halloween, which Kris described as “abnormally low.”) Given that five or more people are actually involved in staging the service, a more realistic statement of the average attendance is on the order of 25. No target attendance goals were ever stated for Refuge in 2010, so I cannot say if such a number represents success or not. In the spring, Diocesan Council approved a grant of $12,000 to St. Paul’s for the new Sunday evening service. To that seed money St. Paul’s contributed another $8,000. In May we brought Kate Eaton to consult in the preparation and launch of Refuge at St. Paul’s. Why does trying to make sense of Refuge accounting have to seem like watching a shell game? Although it would be a big task for me to try to put the annual report on-line without access to the original file(s), I can put up the brochure about the Vestry candidates. The candidates, by the way, are Michele D. Baum (running again after completing a one-year term, Paul Barker, Frank Horrigan, and Sandy Ludman. Click here to see the brochure. As I mentioned in my last post, “Annual Report Part 4,” the senior warden’s report will be distributed at tomorrow’s annual meeting. John Adams’ report is remarkably devoid of usable insight. According to Adams, St. Paul’s is an “amazing church” with a parish secretary with a “radiant smile,” a rector who “has moved our new Vision and Mission for St. Paul’s from a goal to reality,” an assistant rector whose ministries “have invigorated parishioners, young and old,” and on and on. In other words, all’s for the best in this best of all possible worlds that is St. Paul’s Episcopal Church. This Panglossian view can be read below. After many years of worshiping and currently serving on the Vestry and as the Senior Warden, I have come to appreciate that St. Paul’s an amazing church for all its blessings. This became more apparent to me when recently during our stewardship campaign a parish family informed me that they were going to increase their pledge because St. Paul’s for many years has been there for them and during these difficult times they want to be there for St. Paul’s. I thought to myself this is just one example of the many blessings we experience daily at St. Paul’s. The moment you enter the church office you are greeted by the radiant smile of Dorothy Conway, our Parish Secretary. What would we do without her? We could not be blessed with a more dedicated clergy staff that spans many generations and fills our hearts and minds with the love of Christ. It has been a privilege to work with our rector Lou Hays. Lou has moved our new Vision and Mission for St. Paul’s from a goal to a reality. Kris Opat’s ministries from Cornerstone to Blessing of the Pets have invigorated parishioners, young and old. His launch of the new Sunday evening service Refuge at St. Paul’s has introduced us to a new multi-sensory worship experience, inviting to all. Mable Fanguy, Assistant Rector for Pastoral Care, provides spiritual care to parishioners in times of need. She and Lisa Brown have started a new ministry to support families who have children with special needs. Deacon Sandy Ritchie travels to hospitals, healthcare facilities and homes to visit the ill and elderly. Sandy is responsible for developing our dedicated team of Stephen Ministers. Father John Thomas is always there for you when you need him and to provide “food for the journey.” We have been blessed for many years with the ministry of Canon Richard Davies. God Bless Richard in his retirement. We are blessed with the tireless dedication of Steven Hill, Lisa Brown, Rini and Dave Choura, the Sunday School teachers, the Confirmation teachers, and the mission trip chaperones who teach our children and youth Christian values and Episcopal traditions. Thank you Lisa for getting the word out on all the happenings. At the direction of Doug Starr, our worship services come alive with the sights and sounds of beautiful music of the Chancel Choir and instrumentalists. Music for all tastes from guitars and drums at the 8:45 liturgy to traditional hymns and organ music at the 10:30 liturgy fills the Sanctuary. Praise be to God, the Canterbury Children’s Choir is back, thanks to our new Music Assistant, Bryan Sable. Following worship services parishioners transitioning to the Parish Hall are greeted with a welcoming table filled with donuts, bagels, cookies and endless cups of coffee served with grace by Karen Viggiano, Pat McKeone, and Pat Rapp. Coffee Hour at St. Paul’s is a time for greeting friends and making new ones. The spirit of fellowship is the heart of St. Paul’s. We are blessed with parishioners who spend many hours preparing meals and planning programs. The Episcopal Church Women, Altar Guild, Cotillion, and all the women’s groups continue the traditions of service and ministry that we love. Our Outreach ministry stretches from just outside our doorstep in Mt. Lebanon to across the ocean in Africa, reaching out to those in need. New ministries have started with the formation of small group ministries, Education for Ministry (EFM), and adult formations. All the above blessings are shepherded by the leadership of our clergy team and staff, not to say the least by the Vestry and the Vestry Executive Committee of Carl Kylander, Pat Egon Stafford, and Bob Johnston. Bob Johnston, treasurer, and Valerie DeMarco, Financial Administrator, have done a masterful job in developing our mission budget. Bob and Valerie have worked long and hard to maintain the Church’s financial structure during these difficult times. The physical structure of the Church is strong due to the diverse skills and ingenuity of our sexton Vlad, Junior Warden Carl Kylander, and Junior Warden in “reserve” Jim Frantz. I am extremely proud of the contributions made by my fellow Vestry members to the many ministries of St. Paul’s. They have worked hard and prayerfully in making some difficult decisions this past year. You are a blessed group, and thank you. How many ways can we count our blessings at St. Paul’s? Just take a moment and reflect on what St. Paul’s means to you. It means a lot to me, and I am thankful for it and for all those who make it an amazing place. I have not previously complained that the annual report and the Vestry candidate brochure have not appeared on the parish Web site, largely because my expectations of the site have become so low. Yesterday, however, I was told of a former parishioner who still has emotional ties to St. Paul’s and who had hoped to be able to read material for the annual meeting on the Web. He was, of course, disappointed. Of course, The material should have been put on the Web. The e-mail newsletter of two days ago announced the annual meeting, but it did not list candidates and did not contain information about the 2011 budget, which was not reproduced in the annual report. That budget was discussed at the Vestry meeting last Monday, though neither the senior warden nor the treasurer was there to provide explanations. When I attended Saturday Bible Study this morning, the undercroft was set up for tomorrow’s meeting. At the front table were stacks of various documents, including ballots (which a fellow student thought a waste of paper), a report from the senior warden—John Adam’s report was not in the annual report—and a 2011 budget summary. Below, I reproduce the budget information. I am offering this before I have had time to analyze it, in the hope that as many people as possible will be prepared to discuss the budget intelligently at the meeting. I will post the senior warden’s report and additional commentary later today. How much outreach does St. Paul’s do? Judging from the annual report, the answer is not much. Of course, I should be quick to admit that a lot of outreach is undertaken by parishioners that does not show up in the financial information in the report. For example, food bank contributions and meals served at Shepherd’s Heart should not be overlooked. On the other hand, no money from the operating fund is allocated to outreach. The financial operation of the Outreach Fund is shown on page 26. All income is from fund raisers, which facilitated donations to outreach projects totaling $4,300. ECW was responsible for a good deal more outreach, enabled in part by earning nearly $11,000 from the 2010 Canterbury Fair. The accounting on page 28 of the annual report shows $15,218.70 contributed to outreach projects. More details are provided in the ECW report on page 43, which makes it clear that some of the $2,422.05 listed as “parish outreach” might not qualify as money given to ease the pain of others. (Personally, I wouldn’t classify lounge repairs and a new sink as outreach.) Nonetheless, the work of ECW is impressive. As an aside, I should mention that it is unhelpful that information about ECW spending is distributed between pages 28 and 43. It is particularly confusing, as community outreach is reported as $10,817.65 on one page and as $12,796.65 on the other. This is because the $1,979.00 UTO gift is listed separately on page 28 but is included in community outreach on page 43. It is also unhelpful that the Outreach Fund and ECW accounting for fund raisers is done differently. In the Outreach Fund accounting, the net revenue from fund raisers is reported; one cannot learn how much it cost to stage the fund raisers. ECW, on the other hand, reports gross receipts and event expenses, thus providing a more transparent picture of its activities. In the Operating Fund accounting, I cannot fail to mention the item titled “Mandated Outreach Commission.” The label is misleading in two ways. First, there is no “commission” involved here, no group of parishioners lead by a Vestry member overseeing funds to be spent. More significantly, however, the money we pay to the diocese, to The Episcopal Church, and to the Growth Fund, is, as the title suggests, mandatory. Additionally, it is not outreach, but necessary overhead required to run a national church. Paying to run the diocesan office is no more outreach than is paying to run the parish office. We pay into the Growth Fund because doing so is required to get loans from the fund, a service we continue to use. As stated above, Diocesan Council reduced our assessment, based on an appeal request of $6,000. However, as we get closer to the end of the year, we realized that we needed to request a higher reduction, due to our lagging revenues. In the end, the Diocese granted a reduction of approximately $10,500. Thanks be to God! Thanks be to God, indeed! It is embarrassing that one of the biggest parishes in the diocese feels compelled to plead for dispensations from the diocese while less well endowed parishes often struggle to pay their full assessments. The formula for computing assessments is based on income for the past three years, which is intended to compensate for the fact that parish income both increases and decreases. If St. Paul’s cannot pay its full assessment, perhaps our budgeting—and especially our spending—needs some rethinking. How much is the Refuge service really costing? It is difficult to tell what was spent on it in 2010 from the information provided in the annual report. We have been given no clue as to what it—or anything else, for that matter—will cost in 2011. In this installment of my commentary on the annual report, I want to point out some facts about Refuge and ask questions that aren’t easily answered by studying the annual report. The $24,000 grant was from the diocese. It is doubtful that additional grants will be made unless Refuge becomes a runaway success.The items for $1,000 (donation) and $3,000 (donation from Education Fund) are curious. Here is what I wrote in May—see “Following the Money”: “The vestry has apparently spent $4,000 from the Education Fund on the Refuge/Wilderness project. $1,000 was used to send Kris to Denver to check out The Wilderness. The remaining fee was a consulting fee to Kate Eaton.” Given the expense for “consultant,” it seems likely that this is about right. There are two questions here. First, how did the $4,000 become $3,000 and $1,000? On page 21, only $3,000 is shown as coming out of the Education Fund to benefit Refuge. Did Kris decide to pay for his own trip? More significantly, how is funding the Refuge service education? The Education Fund seems to have been raided simply because it was there. In fact, I have no idea where this particular fund came from or what its intended purpose is. In checking earlier annual reports, I cannot find an instance of our having spent any money from the fund. Not everyone will immediately understand the “Clavinova” entry. “Clavinova” is the name Yamaha gives to its sophisticated line of digital pianos. (For further information, see the Wikipedia and Yamaha Web sites.) Apparently, one of Bryan Sable’s first acts after being hired was to demand the purchase of such an instrument for Refuge. Because of the high price of the Clavinova, some imaginative financing was cooked up to cushion the blow. Only $1,880 of the cost was charged to Refuge. Friends of Music contributed another $1000. (See page 27.) Another $3,000 came from the Memorial Fund (page 23). Admittedly, the Clavinova, which is an impressive and flexible instrument, will find other uses. (It was used to mimic a harpsichord last Sunday at 10:30.) Nonetheless, the church spent $5,880 that would not have been spent were it not for Refuge. Even if we are considering only the marginal cost, rather than the fully allocated cost, of staging Refuge, the entire $5,880 cost should be attributed to the Refuge Service Fund. I would like to know more about the $5,264.86 spent for musicians. When Refuge was being put together, we were told that a musician would be hired to play a role similar to Kate Eaton’s with respect to the Wilderness service in Denver. Apparently, however, Bryan is not the only musician being paid to put on Refuge. Does the figure in question represent payment to musicians as occasional workers (i.e., not on the payroll and paying their own taxes, etc.)? Does the figure include whatever we are paying Bryan? Is Bryan actually a St. Paul’s employee? If so, is his salary and fringe buried in the black box labeled “Total Personnel Commission” on page 16? Or is Bryan’s salary prorated to reflect how much of his time is spent on Refuge and how much time is spent on other things? (Parishioners who are not members of the choir likely do not realize how much time Bryan does spend working with the choir and Canterbury Choir.) As in the case of the Clavinova, St. Paul’s would not have hired a second professional musician at all were it not for Refuge. We should not pay Bryan to work with, for example, Canterbury Choir out of the grant for Refuge, but all of Bryan’s cost is avoidable in a parish without Refuge and, arguably, should be attributed to Refuge. Finally, it would be helpful to have a breakout of the $4,073.83 line for “supplies, artwork, music, misc.” It matters how much money went to what. How much of this amount represents a capital investment in Refuge (e.g., pots that are re-used each Sunday) and how much is for consumables that represent an ongoing expense for as long as Refuge lasts? In particular, is “artwork” a capital expense, or is the artwork used for a few weeks and discarded? As of the end of 2010, Refuge has, according to the annual report, netted St. Paul’s $13,373.55. Realistically, that amount is overstated. It may be substantially overstated. An explanation is required. The annual report for 2010 was available at the church yesterday, only one week before the annual meeting. Over the next few days, I plan to comment on the report. My commentary will likely be mostly in the form of questions. Today’s post is the first installment. On a slightly positive note, Lou indicated during the announcements yesterday that the 10:30 service next Sunday will be moved to 10:45, allowing 15 minutes more time for the annual meeting. There may still be too little time to resolve all the questions that might be raised—see “Thoughts on the Annual Meeting”—but the announcement was nonetheless welcome. Alas, I am not a financial person, so the most interesting parts of the annual report, the treasurer’s report and the associated financial reports, are the hardest part for me to make sense of. Nonetheless, the finances of the parish are of utmost importance, so, even if I cannot provide insightful analysis, perhaps I can ask some useful questions. My biggest concern with the annual report, however, is the lack of a 2011 budget. Last year, the report did not contain a budget, although I was able to obtain a “2010 Budget Draft” around the time of the annual meeting. If parishioners are prevented from seeing most of the budget figures, are not presented with a budget for the coming year, and get to choose four people to fill four Vestry positions, what is the point of even holding a parish meeting? Perhaps the meeting should be postponed until we see complete budget figures for 2010 and a proposed budget for 2011. A few days ago, I wrote about the problem of informing all potential worshipers of the cancellation of tonight’s Refuge service so people could watch the Steelers and Jets compete for a berth at the Super Bowl. (See “Every Sunday. Really?”) Since it was clear that no one else would be at the church, I drove to St. Paul’s, parked on Mayfair Drive where I could see anyone approaching a building entrance, and waited to see if anyone came for the service. The good news is that no one showed up. Of course, that was also the bad news. The biggest hope for Refuge is that it will attract the un-churched. Those are the people who had no means of learning that the service was canceled. The obvious conclusion is that no one from the target audience chose to attend today. Admittedly, the Church of the Pittsburgh Steelers offers stiff competition, but the reality is that Refuge is mostly attracting parishioners from other St. Paul’s services. Occasionally, it may have seduced an Episcopalian from another parish to come to see what all the fuss is about. As an aside, I should mention that I drove into the parking lot about 5:40 PM, before I positioned myself on Mayfair. One car was in the lot, but it did not seem to belong to anyone in the building. I did notice, however, that the door to the parking lot closest to the street was ajar. I entered through the door to see if anyone was inside. Apparently, no one was. I returned to the door through which I had entered, engaged the latch, closed the door, and set the deadbolt. I then left the building by the door at the handicapped entrance, making sure that it was locked. No one who has been in the Episcopal Diocese of Pittsburgh for a few years would deny the importance of who is the diocesan bishop. Our diocese is now searching for candidates for the next Bishop of Pittsburgh, and we should all be praying for a good outcome. St. Paul’s is playing a direct role in the search process, in that our own Kris Opat is a member of the Nomination Committee. Interestingly, the consultant to the Nomination Committee—dioceses typically engage an outside consultant to advise them when searching for a bishop—is the Rev. Conrad Selnick, who advised our own search committee when we were last seeking a rector. The quest for the next Bishop of Pittsburgh has not received much attention at St. Paul’s. There isn’t too much we can do, of course, although individual Episcopalians are free to suggest possible candidates to the Nomination Committee. So guide the minds of those who shall choose a bishop for this diocese, that we may receive a faithful pastor, who will care for your people and equip us for our ministries. Be present with those who take counsel in the Standing Committee, the Nomination Committee, and the Transition Committee as we choose a bishop for this diocese, that they may in all things seek first your honor and glory. We should, I think, begin using such prayers in our Prayers of the People. Due to the anticipated effect of the Sunday evening Steelers game on attendance, Refuge at St. Paul's will not be held this Sunday, January 23. If you normally attend the Refuge service, please consider worshiping with us Saturday evening at 6 pm in the Chapel, or Sunday morning at 8 in the Chapel, or at the 8:45 or 10:30 services in the main church. Refuge at St. Paul's will resume on Sunday, January 30. This is not the first time a Refuge service has been canceled with little warning. The last time it happened, I wondered how all those non-parishioners and otherwise unchurched folks that supposedly are being drawn to this service would get the word. Apparently, we actually aren’t too concerned about them. There is no sign outside the church about the cancellation—we no longer update our sign in front of the church—and, at least so far, there is no announcement on the Web site. One of the prominent “Featured Posts” on the parish Web site is “Find Refuge at St. Paul’s,” which invites readers to “…find Refuge at St. Paul’s Every Sunday at 6pm” [emphasis added]. The weekly e-mail message last week noted, “Refuge at St. Paul’s is going strong and we invite you to experience Refuge every Sunday evening starting at 6 p.m.” [emphasis added]. Last week’s bulletin dutifully listed Refuge on the calendar for 6 PM January 23. Of course, that was before the Jets beat the Patriots. Update, 9:57 AM, 1/20/2011: Last night, I received the weekly issue of the diocesan e-mail newsletter “Grace Happens.” It contains a notice about the cancellation of Refuge on January 23. (You can view the newsletter here.) Although it is good that this notice has been distributed, most Episcopalians in the diocese do not even receive the newsletter, and I’m certain that virtually no non-Episcopalians get it. The mention in “Grace Happens” does little to reach the people that are particularly targeted by the new service. After writing my last post. “Clutter,” it occurred to me that some might consider my observations petulant. This led me to think more deeply about the nature of my distress at the state of the church. It seems only appropriate that I should share some of those thoughts here. The term “house of worship” is a telling one. It not only indicates a building but suggests a relationship of people—a congregation—to that building. Those who regularly attend a church develop a strong and intimate relationship with the physical structure, as they do with the buildings in which they live. Partly, this relationship grows from simple familiarity, just as a frequent moviegoer might feel a special affection for a favorite cinema. A parishioner’s affection for his or her church transcends familiarity, however. The church building becomes a physical manifestation—a stand-in or symbol—of the intangible spiritual world. This is clearly seen in the great cathedrals of the Middle Ages. Those magnificent Gothic structures were more than examples of civic hubris—though they surely were that—they also represented attempts to make God’s glory manifest to the people. A church is a place of refuge, of solace, of renewal. It is a source of stability in our lives, and, as such, change, whether involving liturgy, personnel, or physical surroundings, can be disconcerting. We all know that change is an integral part of life and that it is required for growth, or even survival. But we want to feel that we have something to say about change, particularly when it involves our home or our church. It is one thing when a church embarks on a major renovation or even builds a new building. It is quite another when changes—even positive changes—occur with no warning and with no obvious consultation with the congregation. 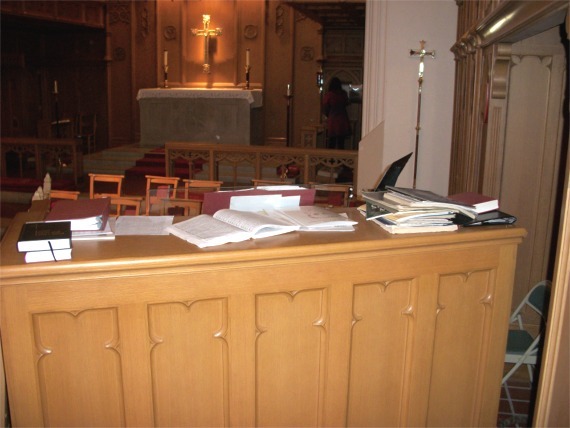 The changes visited upon St. Paul’s as a result of the initiation of the 8:45 and Refuge services were not anticipated by parishioners and are unwelcome intrusions into the 10:30 service, for which the extra speakers, music stands, instruments, and other audio equipment are only distractions. Moreover, the clutter in the south transept suggests to the worshiper at 10:30 that the principal Sunday service is not where church leaders are focusing their attention. Yesterday, for example, despite our reputedly large corps of acolytes, we only managed to find two, not the standard seven, to serve. Excellence in worship had long been a hallmark of St. Paul’s, but many long-time parishioners would argue that, with the exception of music, the worship experience at our church is much impoverished from that of times past. I have long thought that no significant changes to the physical plant of St. Paul’s without the approval of a person or committee responsible for the overall appearance and integrity of the chuch property should be undertaken. Ideally, one might like to see a committee headed by a parishioner who is an architect and whose members might include a representative of the Vestry, a member of the clergy, and a select group of parishioners. The goals of forming such a committee are twofold: to assure that changes benefit the parish globally, rather than simply filling a local need that could conflict with other needs; and that parishioners feel that their concerns are considered and that they will not encounter unpleasant surprises. Hundreds of members move through St. Paul’s every week, and, collectively, they are aware of many small details of which any one person might be oblivious. Ideally, changes to the building should take advantage of our collective knowledge of how the church functions and where it is deficient. Recently, renovations, some small, some not so small, were made to the restrooms at St. Paul’s. All the changes represented improvements, but I’m not so sure they represented optimal improvements. Consider the men’s restroom nearest the choir room. 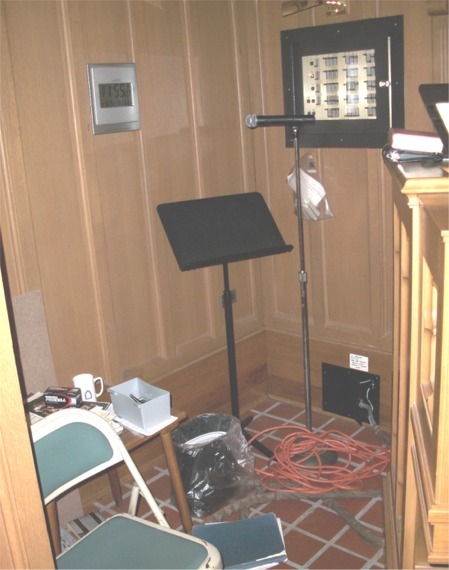 Choir members have long been frustrated by the lack of a place to put their hymnals and folders while using the restroom before the service. The updated restroom now has a vanity that offers some flat surface on which objects can be placed, but an added shelf would have been much appreciated. Of course, no one in the choir knew that changes were going to be made, so they had no opportunity to express their need for a shelf. Why could not a facilities committee have posted a notice outside the restroom soliciting ideas and concerns for a renovated restroom? Not only would this have resulted in a renovation that better filled the needs of the parish, but it would have made the users of the restroom feel better about their church and more cared for. St. Paul’s used to have a Property Commission, which, although it did not really function like the facilities committee I have suggested, at least was a group of people thinking about the physical plant. Certainly a Property Committee could oversee all physical changes to the church. My understanding is that now, however, the junior warden and assistant junior warden function largely on their own and are concerned mostly with fixing things that are broken. St. Paul’s has a history of some renovations being financed privately. This has sometimes led to complaints that the tastes of the donor, not the needs of the church, determine what is actually done. Such objections would be minimized if all changes had to be approved by a facilities committee. Moreover, the committee could build a list of desired changes and their priorities. It could even make the list public and subject to discussion. When someone wants to make a major donation to the church for physical improvements, we could pull out the list and say, “These are our needs. What can you help with?” Similarly, when we are considering a capital campaign, we should have a list of possible projects available without having to do additional analysis. At least we would have a starting point, even though a capital campaign might support more ambitious plans not on our incremental improvement list. Of course, there are other concerns for the attractiveness of the building that have nothing to do with architectural changes. 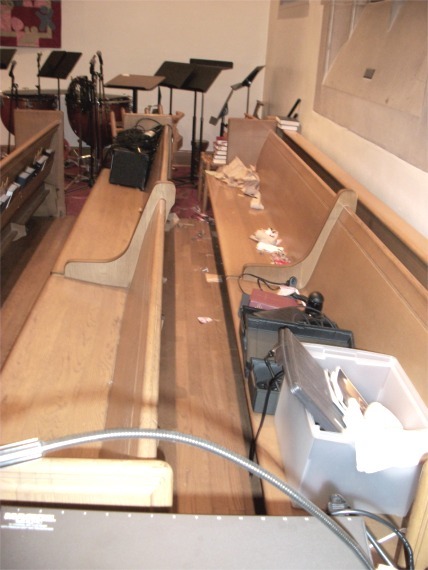 We pick up trash from the pews in the nave and north transept; why do we not do so in the south transept? Is there no way to keep the south transept neat? 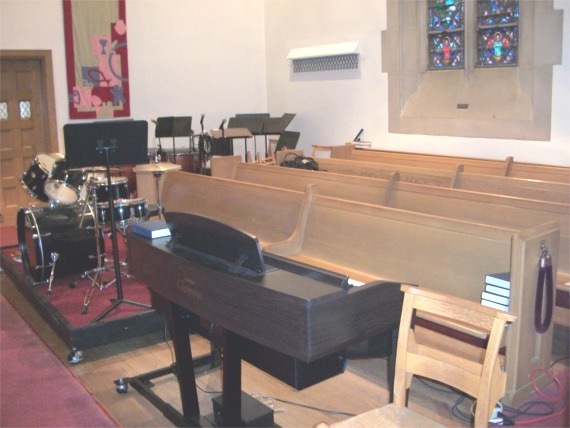 If we were convinced that bands were to be a permanent part of worship at St. Paul’s, perhaps we could make architectural changes to accommodate them less obtrusively. Personally, I hope the bands and the less-than-popular services they support will eventually go away. A PDF version of this post is available here. St. Paul’s is an attractive church, perhaps not a spectacular one, but certainly something parishioners can be proud of. 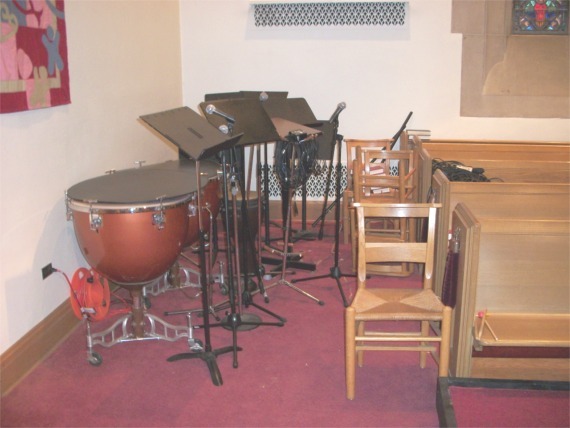 Unfortunately, the music program—and particularly as it relates to the 8:45 Eucharist and Refuge—is filling the church with unsightly clutter. What is not obvious from this photo is the fact that the modesty panel has been removed, which left an irregularly cut carpet. 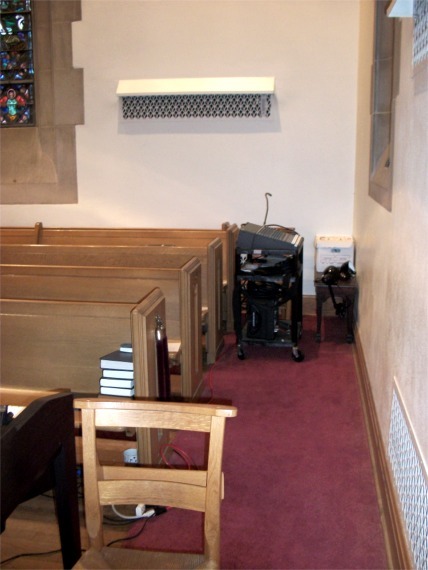 In the next photo, we see the speaker that has become a permanent fixture next to the pulpit, as well as drums, a folding chair, and the cables taped across the floor in front of the doors to the hallway. These items are especially conspicuous. Alas, not even the chancel is kept neat. Below, one can see the top of the organ console. Worshipers can see it also. 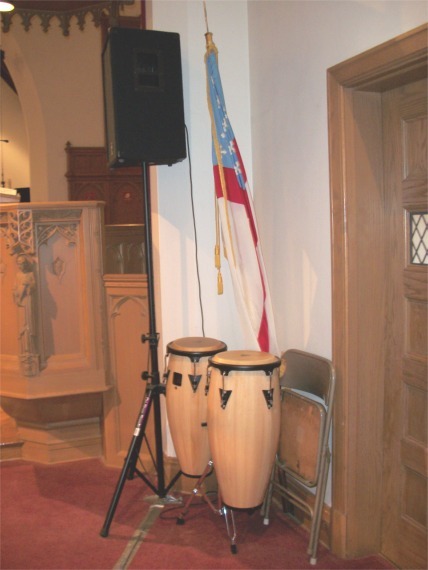 I’m sure that some churchgoers do not mind the speakers, drums, and microphones (or even projectors and screens). This Episcopalian is not so understanding. I am particularly perplexed by the tolerance of broken equipment and paper trash stored in the church. Is St. Paul’s a house of God or perhaps something else? I put the parish’s annual meeting on my calendar today, an activity that caused me to notice that the event is scheduled for 9:30 AM to 10:30 AM on January 30. Given that it takes a few minutes to get everyone settled and the fact that a service is scheduled in the church for 10:30, this implies that the meeting will be about 45 minutes long, if that. In the past, annual meetings have been much longer, though, mercifully, we have lately been dispensing with some of the reports that parishioners can read for themselves in the annual report. Nonetheless, given that the rector claims that the church is in dire financial straits, might there be a need to discuss the health of the parish? Apparently our leaders don’t think so, which, in and of itself, suggests that some discussion is indicated. I see that we have a “Candidate Forum” scheduled the week before the annual meeting. In fact, we have one scheduled both before and after the 10:30 service. Do we have any candidates? In better times, Vestry candidates were announced many weeks before the annual meeting, brochures were available containing pictures, bios, and statements from the candidates. Also, the candidates were introduced at every service, so that parishioners know just who they were. At times, we have even subjected the candidates to a Q&A session, which gave parishioners a much better idea of who they were voting for. If the stewardship campaign was a low-key affair this year, the search for Vestry candidates was even less aggressive. I suspect that people are not falling all over themselves as candidates simply because they are demoralized over the direction the parish has taken. My guess is that the rector will twist the arms of parishioners unlikely to rock the boat, and we will have an election with only as many candidates as there are positions to fill. Then there is the matter of the annual report. When will that be made available, and will the current uncertainty regarding pledge income be used as an excuse to be less than forthcoming regarding the 2011 budget? Alter all, the budget seems to be up for grabs at the moment, and the Vestry doesn’t meet again until less than a week before the annual meeting. In times past, discussion of the budget has been a large part of the annual meeting. Under treasurer Bill Andrews, a session was held in advance of each annual meeting to allow parishioners with special concerns about parish finances to get answers to their questions and, it was hoped, avoid the technical discussions at the annual meeting that bored most of the attendees. I thought this was a positive contribution to parish governance. It clearly is not going to happen this year, and it isn’t particularly clear that parish leaders have many answers anyway. What happens at the annual meeting will, I think, depend greatly on the financial information provided beforehand. Will the financial report illuminate or obscure where we are as a parish? This remains to be seen. I do not expect that 45 minutes will be adequate to discuss what parishioners need to discuss on January 30. What is the plan if that time is indeed too little? As I indicated earlier—see “Some Stewardship Thoughts”—I find the Salary Restoration Fund manipulative and potentially counterproductive. On the other hand, the jobs of most staff people are hardly making them rich, even if the rector is well compensated. Lou has vowed not to benefit from the Salary Restoration Fund until the salaries of everyone else are raised to their 2010 levels. Magnanimous as this sounds, it still has the potential to restore all salaries even as pledged income falls short of its stated goal. May I suggest a compromise, and one that would encourage adequate funding of St. Paul’s? Apparently, a substantive amount of money has been given to the Salary Restoration Fund already. If enough money is received to restore staff salaries, they should be restored. Additional contributions should be allocated to the general fund until such time as the stewardship goal is met. Only then should the rector’s salary be restored. So begins the story “Salary Reductions Announced for 2011” found in The Messenger for January 2011. (As of today, I cannot link to the story, since the latest issue of the newsletter to appear on the Web is from September 2010. What newsletters are posted can be found here.) Until now, my thinking about the salary reductions has focused on the wisdom of the action itself and on the cynicism involved in the creation of the Salary Restoration Fund. I have now begun to think about how the decision was made. The salary decision did not come from the Vestry, but from the so-called Executive Committee, which comprises senior warden John Adams, junior warden Carl Kylander, treasurer Bob Johnston, secretary Pat Stafford, and rector Lou Hays. John Sweeney, who ran the stewardship campaign, was also in on the decision. He, along with Lou and Bob Johnston, apparently were the originators of the salary reduction plan. The Vestry was informed of the decision less than 24 hours before the staff was to be told, but Vestry approval was not sought. As it happens, St. Paul’s’ bylaws are silent on the matter of an Executive Committee, though the rector and officers of the church have long met under that title before Vestry meetings. In the past, before Lou came to St. Paul’s, this was justified as a way of establishing the agenda for the upcoming Vestry meeting. Gradually, however, the Executive Committee has transformed itself into the body that actually governs the church. Most important decisions are made by the Executive Committee in secret and brought to the Vestry for pro forma approval. It is within the power of the Vestry to override decisions made by the Executive Committee, but, in practice, this virtually never happens. In the case of the salary cuts, not even pro forma approval by the Vestry was given. So why do I worry about the operation of the Executive Committee? To begin with, it does not conduct its business in the open. Moreover, since it is very small, it is easier for the rector (or some small number of people) to control the Executive Committee than it is for them to dominate the Vestry as a whole. Since neither the secretary nor the treasurer need be Vestry members, as many as two unelected parishioners can have significant influence, by virtue of their membership on the Executive Committee, over what should be Vestry decisions . At the moment, the secretary of the Vestry is a member of the Vestry, but the treasurer, a past senior warden, is not. Of the four lay members of the Committee, two—the current and past senior warden—have strong emotional ties to the rector, who, one imagines, exercises the greatest influence over what the Executive Committee decides. Clearly, a majority of current Vestry members has been content to see the power of the Vestry eroded, especially its power over the purse, which is its primary responsibility. In three weeks, we will be voting to replace a number of Vestry members. Will the replacements be as compliant as current members? Are parishioners content to see their influence over parish affairs diminished? Will we tolerate the continued abuse of power? Or is St. Paul’s being run so well that we are willing to continue looking the other way in order to benefit from the health that has been brought to our parish by irregular governance? From this listing it is not obvious that neither Jim Frantz nor Bob Johnston is on the Vestry. Nor is it clear what the words to the left of the names mean. “Treasurer” is clearly an office, but “worship,” just as clearly, is not. It would also be helpful to know when the term of each Vestry member ends and whether that person is eligible for re-election, since the bylaws specify term limits for Vestry members. Rather wonderfully, St. Paul’s baptized five people yesterday at three different services. As usual, I sang in the choir for the 10:30 service. Here are a few brief observations about how we handled things at that service. Before the service, I found myself searching in vain for the names of the baptismal candidates. Remarkably, there was no item in the bulletin or the bulletin insert telling who was being baptized and when. Another choir member pointed out that the candidates were listed under the heading “St. Paul’s Prayer List,” along with, of course, other people we were to pray for. It was appropriate that the candidates should be listed there, but, in the past, special notice was taken in the bulletin of baptismal candidates. Families of people being baptized will likely save the bulletin and send copies to relatives. It should be made obvious that we believe that welcoming a new person into the Body of Christ is a big deal. In fact, the “St. Paul’s Prayer List” entry in the bulletin was something of a mess. Although it comprised multiple paragraphs, the paragraphs were distinguished neither by indentation of first lines nor extra vertical space. The structure was further muddled by an extraneous line break that left half a line blank in the middle of the last paragraph. Also missing from the bulletin was the formerly standard prohibition against flash photography during the proceedings. I saw several photographers at work during the baptisms, and I observed at least one flash. The notice about flash photography should be restored next time. There was some confusion as to when people should be standing and when they should be sitting. The choir sat for the Thanksgiving over the Water, but Lou did not invite the congregation to sit until that was completed. On the lighter side, the congregation broke into laughter when infant baptismal candidate Fiona Young latched on to Kris’s dreadlocks and refused to let go. I am told that one of the lighted candles given to a family member of one of the candidates singed the pony tail of another family member, but I did not see this myself and I’m not sure just who was involved. Convenient as it is to access material on the Web, there are times when you really want to read something on paper or you want to give a paper copy of something to a friend. You can always print from a browser, of course, but the results are often unsatisfactory; unwanted material may be included, page breaks may be unfortunate, and the targets of links may be lost on the printed page. Even sites that automatically reformat text for printing may produce documents that are sorely in need of a bit of human editing. The occasional need for reprints of blog posts led me to develop a template for the purpose, which I am trying out using my last post, “Some Stewardship Thoughts.” It takes but a few minutes to convert a blog post into a reprint using this template. See what you think. You can find the reprint of “Some Stewardship Thoughts” here. If you read this document on-line, you can follow all the links in the original post. If you print the document on paper, the URLs that are targets of links can still be read. If you would like a reprint of blog post, let me know, and I will try to accommodate your request. No one likes stewardship campaigns. That is a given. It is also a given that, for most Episcopal churches, stewardship campaign success is a life-or-death matter. St. Paul’s, which has no significant endowment and minimal reserves, is no exception. And it is clear from recent parish e-mail messages and the January newsletter that the campaign at St. Paul’s for 2011 has not gone well. As we enter the new year for which we seemingly have too little money, it is well to ask why that should be so. The 2010 stewardship campaign has been low-key. This is not a new phenomenon. It has been years since a stewardship campaign at St. Paul’s has been anything but perfunctory. As much as I hate to admit it, effective campaigns for pledges need to make a compelling case for supporting the parish and must confront potential pledgers personally about their role in supporting the parish. I don’t think this has been done at St. Paul’s since we used the Pony Express material about two decades ago. The most recent stewardship campaign was occasionally mentioned in church and in e-mail messages, but the centerpiece of the campaign was a packet given to parishioners containing a letter, pledge card, and a stack of new, flashy brochures touting the work of the parish. Most parishioners likely to pledge are reasonably familiar with what St. Paul’s does and does not do, and the oversize brochures on flimsy paper with sometimes poorly edited copy had something of a Potemkin village air about them. From listening to pledge campaigns for public radio, it is clear that deadlines matter. The last few hours of a campaign are usually frantic ones, as people are reminded that their opportunity to contribute is about to end. (However, public radio stations, like churches, never turn away pledges, no matter what the calendar says.) I think there was a Sunday at which we were supposed to turn in pledges, but little was said about it, and there was not much of a buildup to it. No one seemed to be in much of a rush to receive pledge cards. The pledge cards were rather different this year, but perhaps not all the changes were for the better. Certainly, the cards were more attractive. The options for donating stock and of making electronic payments were welcome additions, as was the ability to indicate payment frequency, in the case of cash or check payments. Two items were lacking. First, there was no place on the card to indicate a commitment of time and energy. Although I have always found the request for such a declaration of commitment a bit hokey, it does get people thinking about the nature of their commitment to Christianity and moderates the emphasis on giving money. Second, the pledge card contains no statement making it clear that the commitment being made is all about intention and does not represent a contractual obligation. In an economy in which many people fear losing their jobs, such reassurance could spell the difference between pledging and not pledging for some people. Perhaps St. Paul’s is facing a genuine fiscal crisis, but I have not seen convincing evidence of it. My memory of past years is that we always have concerns about inadequate pledging about this time of year. Our parish seems to have two distressing habits: (1) We tend to wait until the last minute, and (2) we never seem to fund the church up to the desired level. I am perpetually surprised when, as a choir member, I walk down the side aisle at the beginning of a service thinking that attendance is particularly bad, only to see a more filled church when I reach the chancel and turn around. Parishioners tend to be late arrivers. Likewise, many of us do not buy tickets to parish events much in advance. We buy them at the last possible opportunity, frequently at the door. We seem to take the same attitude toward pledging. If the time of the “last possible opportunity” isn’t obvious, perhaps we won’t pledge at all. St. Paul’s has had its ups and downs, but, even in its most prosperous periods, it seems to have only muddled through. The lack of a longstanding endowment is a product of the parish’s long history of hand-to-mouth existence. I don’t know why this is true; it is certainly a handicap under which we constantly labor. Despite messages to the contrary, it is not at all clear that St. Paul’s is growing. (See “Is St. Paul’s Growing?” and “Update: Is St. Paul’s Growing?”) Certainly, attendance is rather flat. Yes, there are newcomers, but there are departures, too, which are hardly ever mentioned. Newcomers, particularly young adults with children and people from church traditions without the same emphasis on stewardship as our own, tend to pledge less than departing long-time parishioners. The Refuge service does not seem to be contributing to the growth of the parish. As best as I can tell, attendance at the service is poor, and the collection from it is designated for the support of the service itself, which undoubtedly is underfunded. Some of the attendees are simply parishioners who would otherwise attend other services. If these people are not pledging, they might be surprised to learn that their offerings are not supporting the overall operation of the church. In any case, don’t expect pledge income from Refuge. At best, the effort is a missionary project, a financial liability, rather than an asset. If, in fact, there is a problem with pledging, one reason might be the lack of enthusiasm for programs of the church. Special events that once drew large crowds all seem to be attracting fewer people. The Wednesday program does not seem especially popular, and people tell me that some folks attend for the food but do not stay for the program. Adult education on Sunday morning has declined under clergy sponsorship over what it had been when it was run by laypeople. I cannot speak for others, but I find worship services less energizing than they used to be. Acolytes may or may not show up. Lights are either shining in my eyes or I’m reading my music in the dark. The sound system makes itself known in various unpleasant ways. The bulletin often contains annoying errors. The flow of the liturgy is constantly interrupted by declarations of what “we” will do next. I cannot see the rector when he preaches. And, perhaps most importantly, the quality of preaching has experienced a serious decline, beginning with the departure of Bill Pickering more than a decade ago. No doubt, others find at least some of these factors have dampened their enthusiasm for their church. Many parishioners have lost confidence in parish leadership. Most obviously, the decidedly cool reaction given the recently proposed “capital campaign” must be seen as something of a vote of no confidence, yet its stunning rejection elicited no indication from parish leaders that the campaign represented a colossal miscalculation. There were, of course, many things wrong with Fulfilling the Vision as an enterprise, but one has to look deeper for the ultimate cause of its failure. Leadership, at least in voluntary communities in which members cannot be coerced, does not consist of developing a vision, announcing it, and having members of the community immediately adopt that vision as their own. The sort of leadership practiced in the former Soviet Union really does not work in a suburban Episcopal church with an educated congregation. In such an environment, the community must buy into major initiatives, either as the result of a well run educational campaign or because the community was instrumental in developing the initiative, thereby making it their own. The selling of Fulfilling the Vision was inept, and the community involvement in its development was a sham. Unfortunately, the failure to build support for initiatives is not unique to the case of Fulfilling the Vision. Neither the 8:45 service nor the Refuge service had much parishioner support, and they seem to have had lackluster attendance, as one might have expected. I am probably in a small minority in my frustration with the lack of financial transparency at St. Paul’s, but I know that others are concerned about it as well. When Bill Andrews was treasurer, his goal was to make all financial transactions of the church visible, even in the case of funds not under the direct control of the Vestry. Gradually, however, Bill’s work is being undone. More and more parish activities are being funded off the books. Most notable among these activities is the Refuge service, for which not even the Vestry has received any reasonable financial accounting. There is also some rather creative accounting going on designed, I suspect, to deflect specific criticisms. For example, there has long been a segment of the congregation that consistently argues that we should give more money away as outreach. I have sometimes found the expectations of this group to be unrealistic, but the reality is now that St. Paul’s now spends virtually no money on outreach, although individual parishioners do spend their own money on outreach projects. (They buy food for Shepherd’s Heart, for instance.) Au contraire, you say. According to the January 2011 issue of The Messenger, in eleven months of 2010, we have spent $68,189 on outreach. Impressive, no? No. This amount represents (completely or mostly) our diocesan assessment. It is not outreach to support the diocesan office or even to give grants to churches to repair their physical plants. The $68,189 is simply overhead required to maintain the infrastructure of The Episcopal Church. The poor, the hungry, the naked, and the incarcerated receive no benefit from this money. When I first read that St. Paul’s was reducing salaries due to the shortfall in pledges, I thought that this was a responsible action to take, though, as I indicated earlier, I was not convinced there was a crisis. The establishment of a “Salary Restoration Fund” at the same time salaries were being “cut,” however, made it clear that the emotions of parishioners were simply being manipulated. It was apparently felt that making the somewhat abstract argument that the church needs more money was ineffective; it was necessary to make the need more personal. Hence, the congregation was being asked to come to the aid of “our dedicated and talented team of clergy and lay staff.” Of course, the projected budget shortfall of $33,000 is predicated on a number of assumptions, including that additional pledges will be forthcoming. The existence of the Salary Restoration Fund, however, may divert pledges from the general fund. It is entirely possible that parishioners will completely fund salaries while still leaving the general fund short. The effect will be to make the rector look self-sacrificing without actually providing the funds needed to run the parish. In other words, the Salary Restoration Fund could well sabotage the purpose for which salary cuts were ostensibly made. St. Paul’s is not a healthy parish. Not pledging will not fix the problems, however. Parishioners should understand that the church is their church, not the rector’s and not the Vestry’s. No one, I think, should contribute to the Salary Restoration Fund. Simply give money to the parish and, if enough people do so, salaries will take care of themselves. The annual meeting will take place soon. This will be a time to take responsibility for your parish. Questions need to be asked about how the parish is being led, how finances are being represented, and what activities people are willing to support. Finally, well-intentioned, independent, talented people need to be elected to the Vestry. Would you be willing to be a candidate for election?